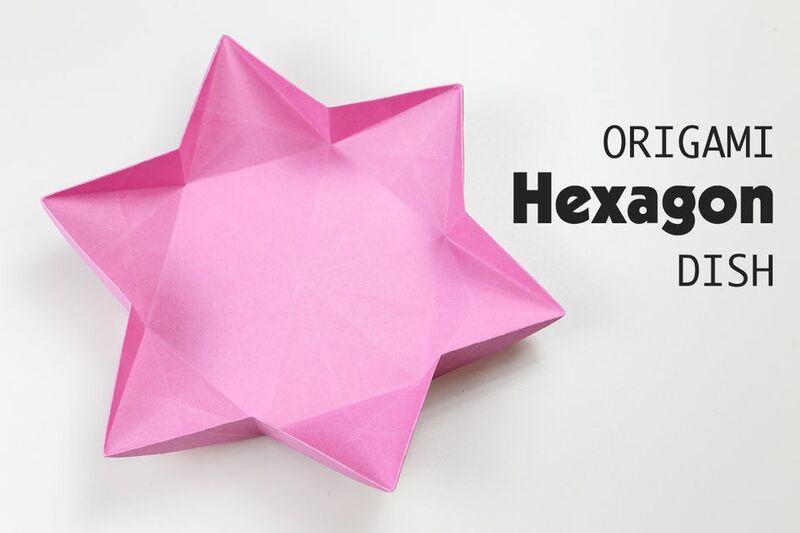 Learn how to make a pretty and functional hexagonal origami dish or bowl. This origami dish is perfect to serve snacks or sweets at a festive party, or store your jewellery and other small items in style! This origami dish starts with a hexagonal piece of paper, you can learn how to make one from a rectangle here, or from a square. Previously I posted a tutorial on how to make an origami star dish that starts with a pentagon, you can check that out here. You will need just one sheet of paper for this tutorial, if you use paper that has different colours or patterns on each side, the result will very unique. I suggest using paper that is sturdy but it will also work with thin paper. If you're looking for a super easy origami dish/bowl, you can start with the Easy Origami Candy Box which is suitable for complete beginners. Start off with your hexagon, learn how to make one from a rectangle here. 1. We'll be fold the paper on the lines indicated. 2. Fold each flat edge to the center and unfold. 3. You should be left with these folds. 4. Fold the hexagon in half, point to point on all 3 axis. 5. You should be left with these folds. 6. Now fold all 6 points inwards along the lines that are indicated. 8. Now again fold all 6 points inwards as shown. 9. You should now have this, flip the paper over. 10. You'll be folding along the lines that are indicated. 11. Fold each point into the middle and unfold. 12. You should now have this. 13. Push all 6 flat edges inwards to create the star shape. 14. Keep straightening the edges and you can adjust the structure of the dish. If you would like the folds to be on the inside instead of the outside like the purple dish in the picture, don't flip the paper over in step 9, instead just continue folding on that side.